The Ringling, in its affiliation with Florida State University (FSU), is one of the largest museum/university centers in the nation. The Ringling is always willing to consider individuals for positions who are passionate about the work they do, will be dedicated to the institution, are inspired by our mission, and are inventive in the solutions they find to assigned tasks. Located on an impressive 66-acre Sarasota bayfront estate, it preserves the legacy of John and Mable Ringling, educating and enabling a large and diverse audience to experience and take delight in a world-renowned collection of fine art and special exhibitions; Ca' d'Zan, the Ringling historic mansion; the Circus Museum; the Historic Asolo Theater; and Bayfront Gardens overlooking the Sarasota Bay. The Education Building houses our library, conservation facility, classrooms, and staff offices and the Visitor Pavilion serves some 350,000 guests annually. 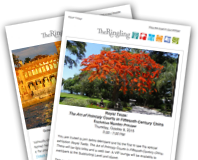 Enter Keyword “Ringling” and click Search to view available positions. Click on Posting Title for a full description of the position. Click "Apply Now" OR Click "Return to Previous Page" to view full list again. The online application must be completed in full. A Cover Letter and Resume may be attached if desired. You may Login to edit your application and/or apply to a new position opening. Please call 941-359-5700 Ext. 2605 for assistance with the application process. Check often for new openings, they will be posted as the become available.